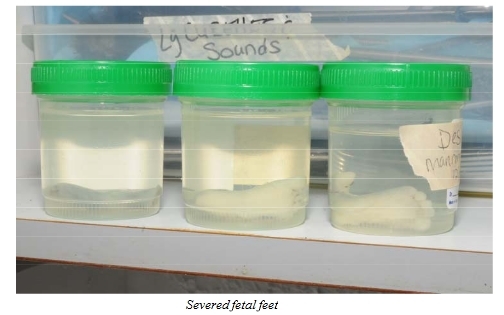 Another of the doctor’s practices that defies explanation was his habit of cutting the feet off of aborted fetuses and saving them in specimen jars in the clinic. Kareema Cross showed the Grand Jury photographs she had taken in 2008 of a closet where Gosnell stored jars containing severed feet. During the February 2010 raid, investigators were shocked to see a row of jars on a clinic shelf containing fetal parts. Ashley Baldwin testified that she saw about 30 such jars. None of the medical experts who testified before the Grand Jury had ever heard of such a disturbing practice, nor could they come up with an explanation for it. The medical expert on abortions testified that cutting off the feet “is bizarre and off the wall.” The experts uniformly rejected out of hand Gosnell’s supposed explanation that he was preserving the feet for DNA purposes should paternity ever become an issue. A small tissue sample would suffice to collect DNA. None of the staff knew of any instance in which fetal feet were ever used for this purpose.